Stuart Gillies takes up Patchwork, digistyle! Uwe Rosenberg’s 2014 board game Patchwork is making its digital debut thanks to Digidiced – who also brought Uwe Rosenberg’s 2008 board game Le Havre to your devices last year. 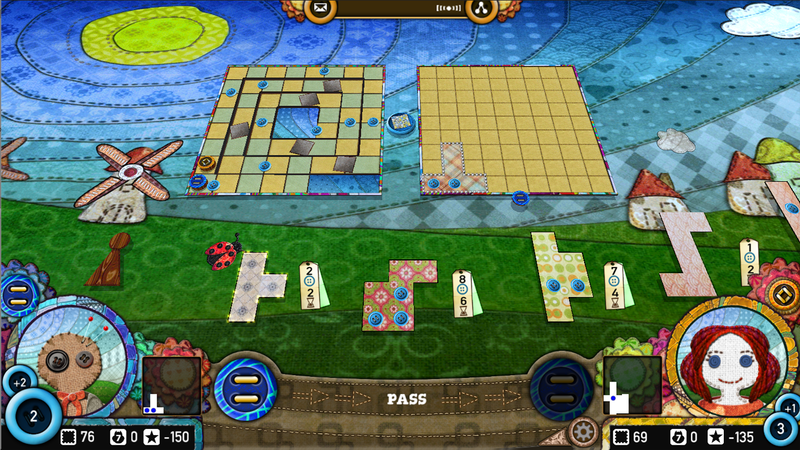 Patchwork is currently on release for iOS, Android and Windows phone. The game is an excellent representation of how board games can be brought to the digital age with style. But does Patchwork work on the mobile screen? 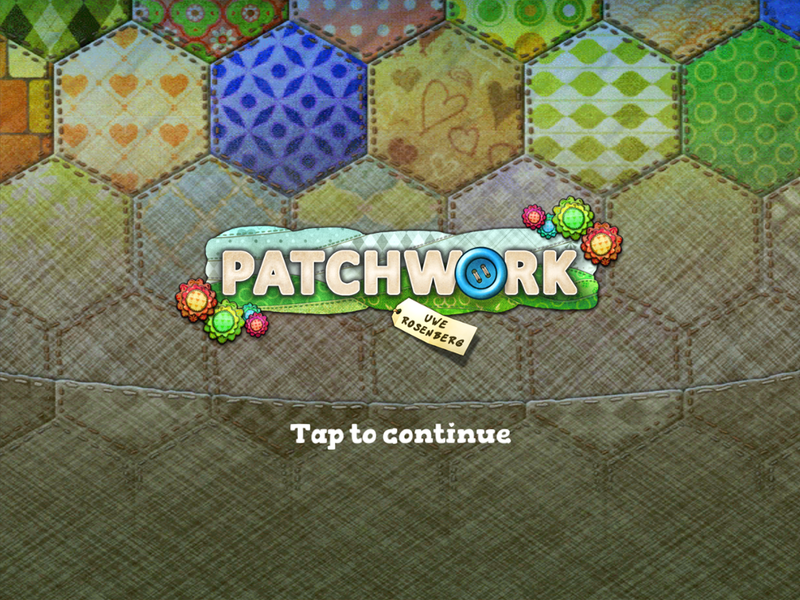 Without having played the board game version of Patchwork I cannot compare the digital release to its predecessor. However, I feel this means I can comment on the games accessibility. As the game is introduced to you through the obligatory Tutorial, you are given the briefest of briefs on how to play the game. The fact the game bugged out on me both times I tried the Tutorial does mar the game as an overall product. The visuals of the game are really nice. 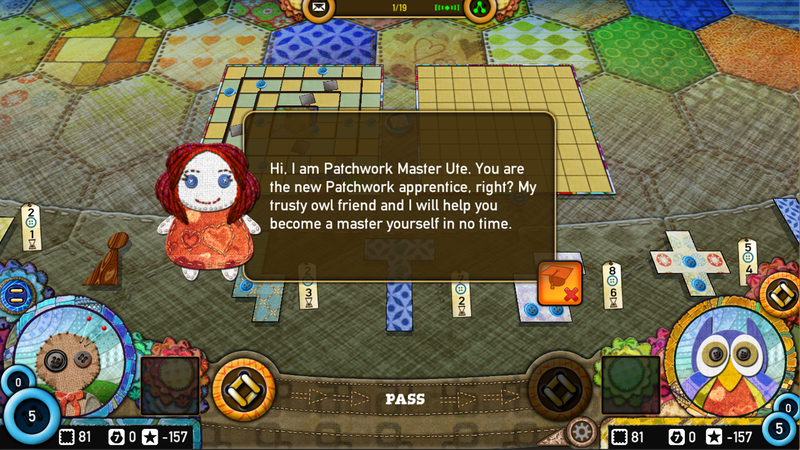 The patchwork characters and backgrounds are appealing but don’t draw your attention away from the game. The detail they went into for these shows that they put in the effort for styling. You are also able to change the background. You can currently choose between two options but Digidiced have said they will release “an ever increasing number of backgrounds and colourful patterns”. I also really like how the patches are stitched into the base, forcing your opponent to wait that little bit longer until you have finished your last cross stitch. Gameplay is the key feature of board games. You want something that is simple enough to teach in 10 minutes, but with enough complexity that you want to, no, need to, come back for that re-match. Fortunately Patchwork checks both of these perfectly. Initially, only testing my abilities against the AI in local play I got a good few games under my belt before facing a real person. This was for two reasons, to make sure I understood the base game rules properly, as well as to check the game was complete enough for playing with others. Unfortunately, there seems to be a difference between local Vs AI and Local Vs Guest. Local Vs AI ran perfectly and didn’t have any real bugs (the patchwork pieces rotating diagonally on their axes did look weird but didn’t stop you placing them, but they did stay in their diagonal position). Local Vs Guest played fine but the scores were accumulating (at least in display if not in actual score) on the Local points tally. Meaning that you couldn’t accurately tell how many points you or your opponent had. This isn’t an issue if you are not playing seriously, but if you are it hampers your ability to play as part of the game is determining what pieces are coming up and whether or not your opponent can afford pieces, which diminishes your ability to play effectively. Who knew making a patchwork quilt would be so cut throat. Not me, for one. However, I also didn’t foresee how much fun the game would be. I had high hopes for the digital release as I find myself being more interested in board games, and having them stored on a tablet makes them easier to carry and, subsequently, share with others. The bonding aspect as you share how to play the game conversely allied with the desire to win, when you are opponents on the battlefield of buttons and thread. 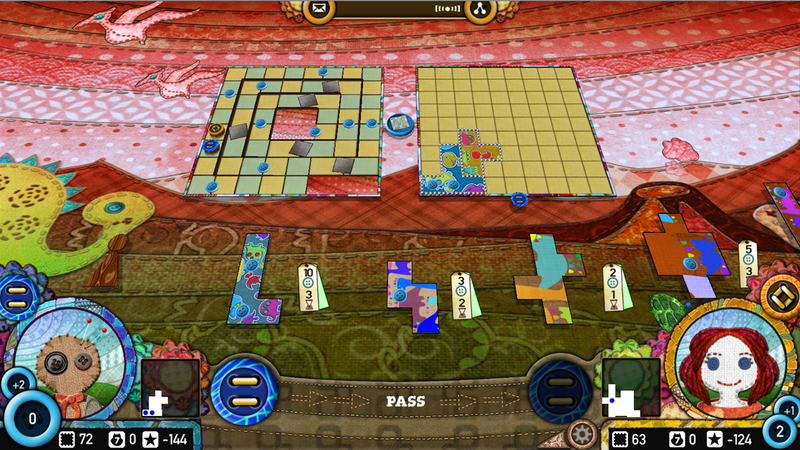 The game has you create a quilt out of the titular Patchwork. You do this by selecting 1 from the 3 available patches. Each patch having a cost (buttons) and time (moves). The amount of moves that each patch contains moves your player around the game board. The turn is always the player who has moved the least. As your player moves you cross buttons and single patches. When you cross the button you are dealt a corresponding amount of buttons your patchwork contains. It is a simple game to learn but one with serious depth. So how do you win in Patchwork? The same way you win in life, buttons and fewer holes than the other guy. Buttons are worth 1 point and holes subtract 2 points. You also get a bonus if you are the first to entirely fill in a 7×7 area. I have yet to play online. 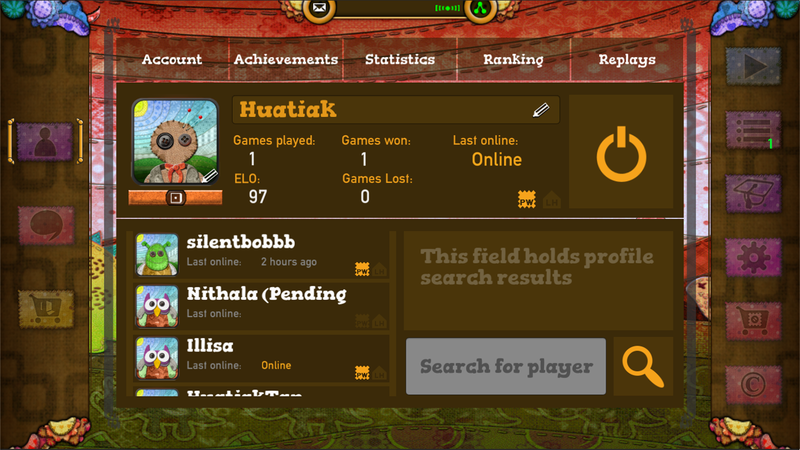 Not for lack of trying, but when I attempted to play there was only one person wishing to play online. This is where I learned that you can run multiple games at once. I actually really like this feature. 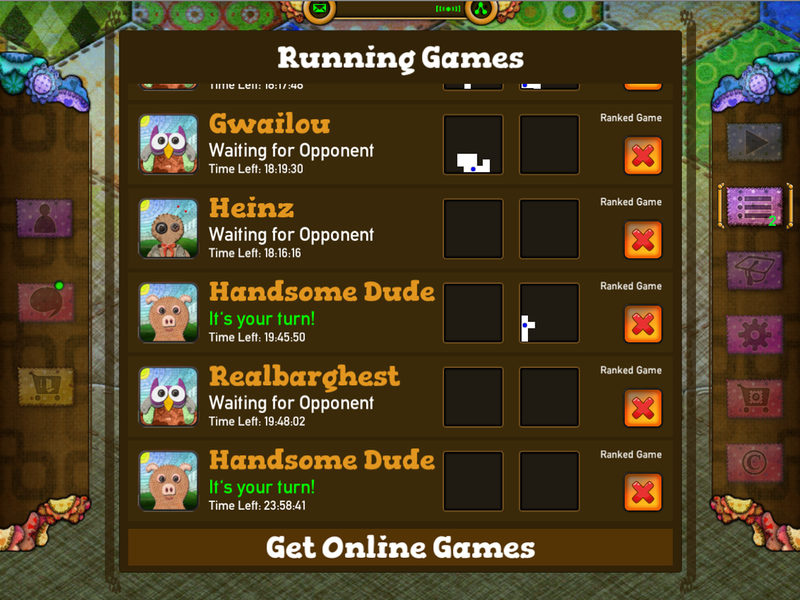 It allows you to play a random player whenever you want… kind of. As the game loaded I waited for my adversary to make his move. 20 minutes later I was still waiting. The game is still running as I await them to make their first move. Maybe I should look for more games….